How Security Guard Booths Can Benefit Your Business | BIG Enterprises Inc. If you want to increase the security of your facility, it is important to consider the inclusion of a guard booth. Not only are security guard booths an excellent way to increase the safety of your property or business, they improve overall efficiency. In fact, a security guard booth will establish a positive first impression and help you maintain better control access. Below are some of the primary benefits that a booth will provide your business. One of the greatest benefits of security guard booths is the tremendous amount of flexibility. B.I.G. Enterprises offers extremely “plug and play” booths, which makes moving them from one location to another relatively easy. If your security needs ever change, this level of flexibility can be quite convenient. These guard booths can be retrofitted for a variety of applications with relative ease. Regardless of what the future might hold for your facility, you can be assured that B.I.G. Enterprises has your security booth needs covered. To select the best booth design and layout according to your specific needs, our team of experts would be pleased to help. Because selecting from a variety of wall finishes for these security booths is so easy, you are never locked into one particular design. Again, if your needs change at some point, this is a huge advantage. These guard booths can also be ordered prefabricated in a variety of sizes. In fact, an array of additional features and options can be incorporated into the finished design. Regardless of the facility size or your current needs, you can find a security booth customized to your business and premises. Enhanced security is one of the most significant benefits of adding a security booth to your facility. Regardless of the nature of your business, you may have numerous reasons for wanting better control over the access to your facility’s entrance. With security booths, you have the opportunity to control access and always know precisely who is present on the premises at any given time. If theft or some other mishap occurs, having this information would be extremely valuable. B.I.G. Enterprises booths are built to be tough and durable. Whether you need to monitor equipment or control access to the front gate, these booths will give you greater peace of mind. 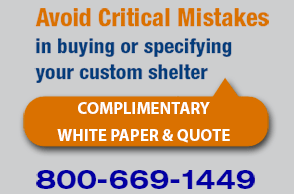 Beyond knowing what to look for in security guard booths, you should have a good understanding of what to expect from a reputable booth manufacturer. One of the many factors to consider when choosing a manufacturer for your security booth is how long it has been in business. Additionally, you should know about the company’s specific experience and consider the company’s reputation. At B.I.G. Enterprises, we are pleased to have a strong commitment to quality and over 50 years of experience necessary to deliver just what you need. If you have any questions about ordering your next security guard booths, our dedicated staff will be happy to assist.